At their seasonal, monthly party, Aima the Dreamer, Lady Ryan, and DJ Emancipacion seek to empower Oakland’s queer women of color on the dance floor. Lady Ryan (L), Aima the Dreamer, and DJ Emancipacion (R) reclaim top forty in the name of the goddess. 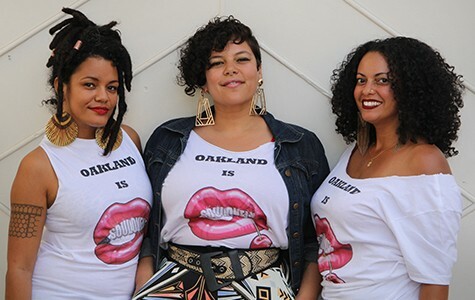 During Oakland Pride last month, a diverse crowd of mostly women packed into the New Parish for Soulovely, a daytime party that takes place on second Sundays during the summer. Though the dance floor in the venue's courtyard was completely full, people of different ages and ethnicities unselfconsciously got down in the aisles, on top of the benches, and in the bathroom line. As DJs Lady Ryan and Emancipacion mixed house beats with African rhythms and hip-hop classics, enthusiastic partygoers joined Aima the Dreamer, the party's host, in chanting "Black lives matter" over the music. Lady Ryan, Aima the Dreamer, and Emancipacion began throwing Soulovely in 2011, though the three of them agreed that the party truly began to flourish this summer after four years of growing their following through word of mouth. Because this year's series was so well attended, they have extended Soulovely through November and are considering making it year-round. 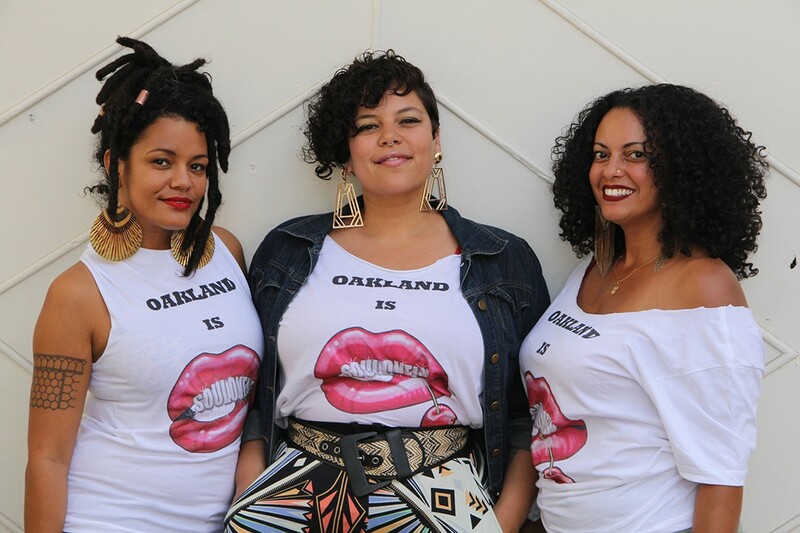 The three performers are longtime friends who have been active in Oakland's various nightlife enclaves since the early Aughts. Soulovely doubles as the name of the party and their music collective, which they forged as an alliance of queer women of color amid the city's largely male-dominated DJ scene. While they don't explicitly advertise the event as a queer party, their longtime involvement in the LGBTQ community draws a mostly queer crowd — though they emphasized that straight allies are also welcome. "There's a large queer people of color community that has stepped up to say, 'Soulovely is ours,'" said Aima in an interview. "There's such a beauty in that. ... And when we also create space for all of our allies to come in, in all their different forms, then that safe space and mutual respect creates an opportunity for dialogue." That cross-pollination of various Oakland communities is something that the three musicians strive for across their collaborative and individual projects, and, in our conversation, they all stressed that they don't want identity politics to limit where they perform. For instance, Lady Ryan regularly spins at LGBTQ parties, including Ships in the Night, which also takes place at the New Parish, and Swagger Like Us at El Rio in San Francisco. And though she has many supporters in the queer scene, she also frequently throws events outside of it, such as her new party, Tongue, which takes place on second Fridays at the Senegalese restaurant Bissap Baobab in downtown Oakland and features live drummers and music of the African diaspora. Emancipacion got her start DJing Bay Area queer parties in the early 2000s, as well, but has also found an audience in the local Middle Eastern community, in which she is also involved. House music is Emancipacion's passion and she seeks out events where she can play club beats with international influences rooted in her Egyptian heritage. She frequently performs at special events — such as the closing party of San Francisco's Arab Film Festival taking place later this month. As a rapper and singer, Aima the Dreamer is also involved in a spectrum of music projects. She is a vocalist in the Oakland hip-hop-jazz-funk fusion bands J-Boogie's Dubtronic Science and Jazz Mafia and recently performed at Oakland Music Festival and Symbiosis Gathering. She also released an album earlier this summer with her hip-hop duo, Femme Deadly Venoms. "I'm really lucky as a queer woman to play in so many different scenes. It's super easy to get pigeonholed," said Aima. "We happen to be three women who really break these boundaries, and that's something I'm really interested in in general: having these places where [different kinds of people] can meet and be respectful and be safe and really celebrate one another." Though they enjoy playing for different kinds of audiences, Ryan, Emancipacion, and Aima agreed that Soulovely is special because it provides a place for them to connect with other queer women of color, many of whom are also activists and creative professionals. Some frequent attendees are longtime pillars of the LGBTQ community — such as Chaney Turner, a promoter who runs Social Life Productions, and Christiana Remington, who throws the long-running queer party Butta. Because it attracts an intergenerational audience, Soulovely has become a place for folks who have been in the scene for ten or twenty years to mingle with newcomers. Each month's Soulovely features guest performers, and Aima, Ryan, and Emancipacion have used the event as a platform for booking female DJs, drum troupes, and dancers. Aima boasted that in the party's four years, they've never repeated the same guest artist. "It just goes to show how thick the female DJ scene is," she said, recalling how promoters in male-dominated spaces have told her that they don't book female performers because they don't know any. "I get told all the time, 'You're the only female MC I know,'" Aima continued. "I'm like, 'Have you turned on a computer?'" Aima, Ryan, and Emancipacion seek to make Soulovely an uplifting experience for partygoers, and the music they play in their sets is thoughtfully curated to create an atmosphere that fosters community building. While Emancipacion enjoys mixing Arabic house music with songs by more mainstream artists such as Kendrick Lamar, Ryan specializes in dancehall, funk, and hip-hop and R&B throwbacks with feminist leanings. "It's a place where you get a chance to listen to music that really feeds you," Aima explained. "You're not gonna be abused by the music at Soulovely. You're not gonna hear the b-word all the time." "The integrity of the music allows us to play across that large generational gap. Some people bring their moms to the party," Ryan added. "And you're not gonna hear any top forty," Emancipacion emphasized. "And if you do, Ryan probably did it," Ryan joked, finishing her sentence. "And I probably rapped over it and reclaimed it in the name of the goddess," Aima laughed.